The intention behind the Music Machine project was to create a number of small, simple programs that generated music within certain parameters. To date there are thirty one Music Machines most of which can be downloaded by clicking here or on the image below. To find out more about the background to the machines click here. All of the first 20 Music Machines were written using Realbasic on a Mac running OSX. All are now available for both Mac and Windows. stand alone installation works or one off pieces. I am now using a raspberry pi computer and arduino uno to run the machines and programming in python. 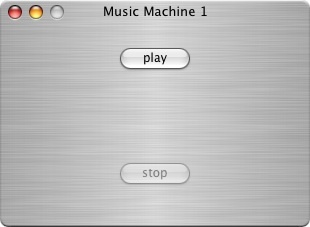 I have recently developed Music Machine 1 for live performance - read about it here. You can also download the score and perform the piece by following the instructions.